Radical Notion: Did The Early Universe Have Just One Dimension? A radical new notion might kill nearly all inconsistencies in modern physics and cosmology in one fell swoop. Prof. Dejan Stojkovic, assistant physicist at Buffalo University and team has proposed the startling hypothesis that the nascent Universe may have had just one dimension. They suggest that the Universe begins to ‘grow’ dimensions as it expands and cools. What exactly is the hypothesis? The Big Bang theory suggests that the Universe began from an infinitesimal point and then expanded rapidly in all directions and in time. This new hypothesis would mean that the early Universe expanded in a straight line, and then into a plane and then into the three dimensions we see today. The radical idea further suggests that as the energy density of the Universe falls (i.e. the Universe cools), more dimensions open up. A fourth spatial dimension might have already opened up at cosmological scales, opines Stojkovic. The team even suggests a test to verify this hypothesis. Since gravitational waves exist only in three spatial dimensions, they could not have existed in the very early Universe. Data from Laser Interferometer Space Antenna (LISA) should not detect any gravitational waves from that time. 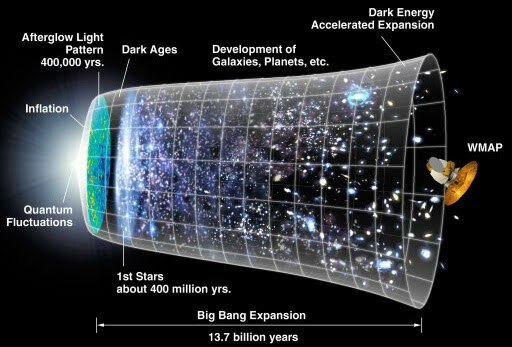 Since looking deeper in the Universe represents going further back in time, analyzing light from very far away should give verification. However, gravitational waves are extremely hard to detect owing to their extremely small theoretical magnitude. Further, this is a negative test, which is not very good for a theory. The gravitational waves might just be there, but may be too feeble to detect. How does this resolve inconsistencies? Stojkovic claims that this notion may remove the incompatibility between quantum mechanics and general relativity. The idea might even solve the mystery of the accelerating expansion of the Universe. Stojkovic claims that addition of new dimensions would explain the accelerating expansion. All that can be said about this idea is that it is radical, but untested. Many radical and beautiful ideas have gone out of the window, after failing to stand up to experimental tests. “If it disagrees with experiment, it’s wrong”.